Metal Gear Solid has always been a strange game series in a strange place. It’s full of irksome tics, like pedantic 40-minute monologues and out-of-place fantasy elements in an otherwise realistic world. Yet it was so ahead of the curve in other areas—visually, aurally, and in terms of storytelling ambition—that its oddball tendencies were tolerable. Sixteen years on, the series has never shed its peccadillos, and they have become part of Metal Gear’s unique voice. It’s also one of the last Japanese game monoliths that still holds sway in the Western mainstream. The series’ developers have never had to choose between being weird or popular, but Metal Gear Solid V: Ground Zeroes feels like it’s forcing the decision. Possibly. There might not be enough here to tell. This is a slight offering, which doesn’t just mean that it’s short. It is short, though—the main story mission can be polished off in a meandering two-hour play session, and the small missions that are subsequently unlocked take about 20 minutes each. But it’s also slight of story, and relative to its predecessors, it lacks some depth of play. 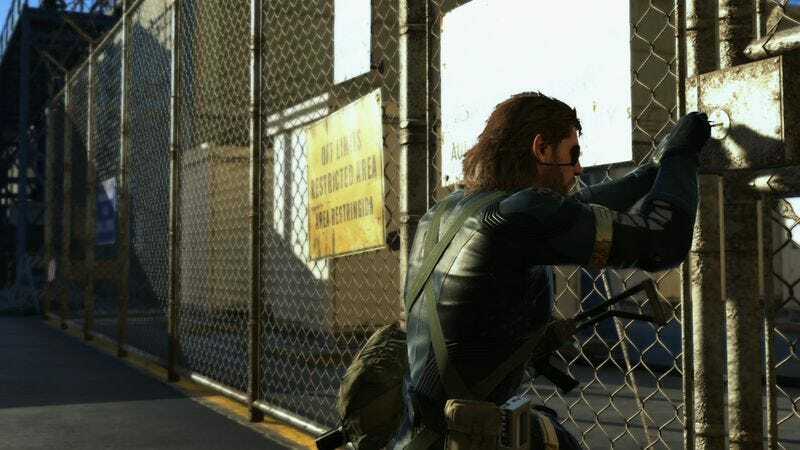 Ground Zeroes is a bridge piece, meant to connect the events of the last Metal Gear game, Peace Walker, to the events of the next one, The Phantom Pain. It does this, and only this. Characters introduced in Peace Walker are not re-introduced here, and the uninitiated are only given a few pages of text to get their bearings on the story. Anyone hoping to use a familiarity with the series’ hero, Snake, as a point of entry will also be at a loss. That connection has been severed by the transition to Snake’s new voice actor, Kiefer Sutherland. His new Snake doesn’t feel like the old one, and no time is taken to accustom players to the change. Instead, this new Snake is dropped into Camp Omega, an American black site in Cuba, with a straightforward mission: Rescue Chico and Paz, two characters from Peace Walker. Snake, who at this point in the timeline is the owner of a military contractor, infiltrates an American prison facility for largely personal reasons. The game glosses over the moral implications of that mission, leaving the player to enjoy a few hours of pleasant, low-context sneaking. The espionage fantasy is well rendered here, and maneuvering Snake through bushes and behind tents to drop a single sleep dart into the back of a guard’s head is fast and satisfying. The open-world design of the small base camp allows you to consider a variety of paths through the shadows. And if you blow Snake’s cover, it’s time to gear up for what could be a protracted gun battle, allowing for some standard shooty fun before Snake is overwhelmed and discretion is inevitably restored as the better part of valor. Whether you’re shooting or sneaking, the enemies behave believably, although they are still generally inclined to seek suicide-by-spy. You can disabuse them of this habit by ratcheting up the game’s difficulty level, which also practically eliminates the possibility of succeeding through violence. It’s a solid challenge for those who play for keeps. The game design is modern and streamlined, with a focus on keeping the player locked on the action. Still, this design may have ironed out too many wrinkles. The fascinating camouflage systems from earlier games don’t make an appearance here, and Snake’s health and stamina are no longer rigidly metered. In the past, this metering had allowed for interesting bits of meta-play—Snake could smoke cigarettes to steady his sniping hand, for instance, but at a cost to his health. Thanks to the elimination of so many little details, this is the first Metal Gear Solid where it’s not necessary to spend an inordinate amount of time fiddling with inventory and menus. On the other hand, no cigarettes. But for someone who has played a lot of Metal Gear—and this seems to be the intended audience of Ground Zeroes, since the game provides so little backgrounding—it’s hard not to feel that something is being given up as the series moves forward. For all of its basis in real history—in philosophical monologues on nuclear war and the growing power of private military corporations—this series has always been charmingly weird. These are games that would read the save data of other games to make fun of the player’s lifestyle choices, and where a hairless, soda-addicted monkey in a diaper is just one of the guys. Even the hyper-masculine growling of Snake’s previous voice actor, David Hayter, added to the series’ strange tone. Together, all of this made Metal Gear a kind of magically realist morality play. Metal Gear Solid V: Ground Zeroes is not that (though it has some meta-jokes and oddness walled off in a couple of the extra missions). It is just a polished spy game that has something to say, but not too much and not for too long. It speaks well. But for those of us who spent years tuning ours ear to Metal Gear’s strange language, this is the first small sign that it might soon be time to throw all that work away.